Abstract: In this article, I will explain what happens behind the scenes in the Entity Data Model and also looks at the files responsible to generate the code and execute queries on your behalf. 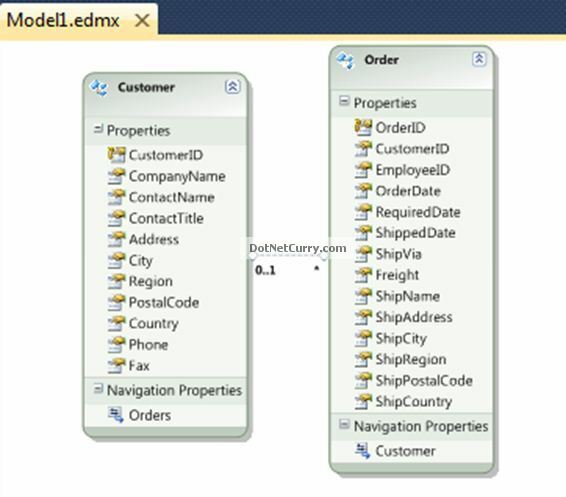 In my previous article Create an Entity Data Model From a Database – Entity Framework 4.0 we created our first application using Entity Framework 4.0 and Visual Studio 2010. We saw how to create an Entity Data Model and also query it. In this article, I will explain how the Entity Data Model works and the files responsible to generate the code and execute queries on your behalf. 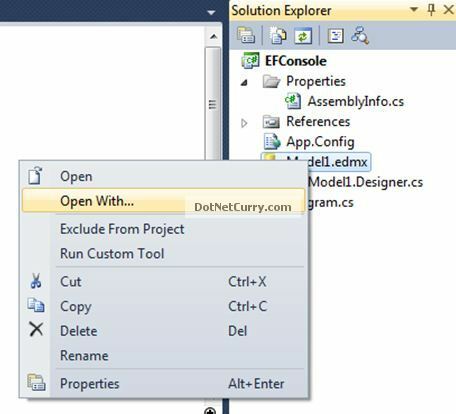 Assuming you have downloaded the code in my previous article, open your Solution Explorer and look out for a file called Model1.edmx. 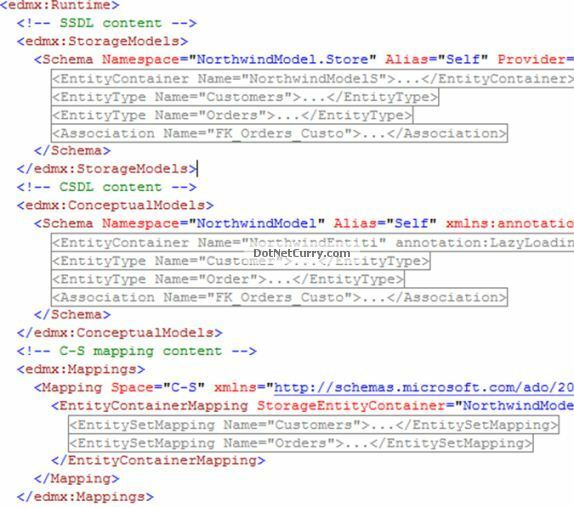 This file is an XML file that defines the schema for your data model. You will also find a file called Model1.Designer.cs. This file contains the mapping objects for your data model. Let us explore what is inside this file. Right click the Model1.edmx file > Open With.. > XML (Text) Editor > OK.
Once you open Model1.edmx in the XML Editor, pay attention to the 3 main sections in the file: SSDL, CSDL and C-S mapping. Logical Layer: The Logical Layer also called Storage Layer is defined by the Store Schema Definition Language (SSDL) and defines the structure of the tables and relations between them. Conceptual Layer: The Conceptual Layer is defined by the Conceptual Schema Definition Language (CSDL) and defined .NET classes. Mapping Layer: The Mapping Layer is defined by Mapping Specification Language (MSL) and connects the entity type definition from the CSDL to the metadata defined in the SSDL, hence the name C-S mapping. So the mapping is essentially from .NET classes to the table structure and its relations. At runtime, this .edmx is split into these three different files (.ssdl, .csdl and .msl). Feel free to explore the different layers and study the mappings to understand them better. 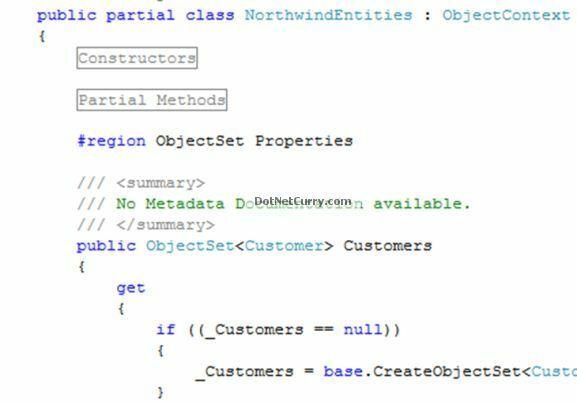 The most important part to observe is that the ‘NorthwindEntities’ is a partial class that inherits from ObjectContext. The ObjectContext class provides facilities for querying and working with entity data as objects, keeping track of the entity objects, along with the state information (added, modified, deleted) and the ability to update entities and write changes back to the database. 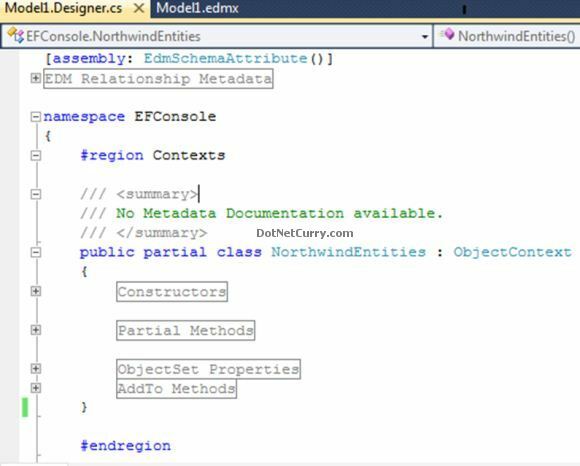 If you look at the NorthwindEntities class, you will see it has constructors that let you connect to the database from which the model was generated. Let’s see how the constructors are used at runtime. Go to the Program.cs file we created in our previous article. You will observe that we are using the query-expression syntax to write LINQ queries. 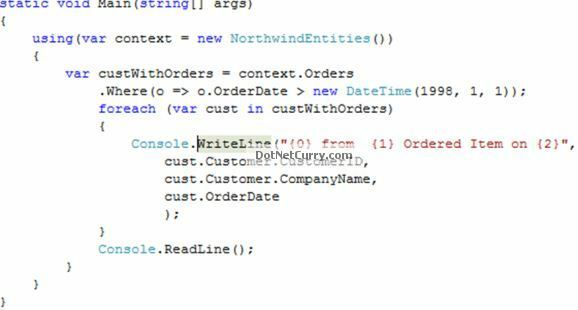 What we are doing here is creating a new instance of the ObjectContext and implicitly establishing a connection to the database (using the constructors of the NorthwindEntities). Observe the code is wrapped in a using() block. This is a good programming practice as when the execution leaves the using block, a call is made to the Dispose() method on the ObjectContext, which closes any active database connections and does critical resource cleaning for us. Add a breakpoint after the foreach loop and debug the code to understand the rest of the code better. We see that when we request for the EntitySet ‘Orders’, EF returns a System.Data.Objects.ObjectSet of ‘Orders’ type and uses the Orders navigation property to query all the Orders whose OrderDate is after 1st January, 1998. Note: An ObjectSet represents a typed entity set that is used to perform create, read, update, and delete operations. ‘ObjectSet’ derives from another class called ‘ObjectQuery’ which we will see shortly. It is this ObjectQuery class that is used to construct queries and execute them. In return we get objects against which we can perform actions like adding new objects or deleting existing ones. Once the ObjectQuery gets executed, we get the Orders results which also contains relationship to the Customer table. Finally, we use the cust variable to access the properties of the Orders and Customer table and write it to the console. Note: The System.Data.Objects namespace is an important namespace with a number of classes that provides querying functionality for EF. If you are wondering where did we use the different layers of .edmx file we discussed earlier, then keep in mind that the ObjectContext class is generated, by reading the conceptual layer of the model. I hope we are making some progress here and you are able to relate the different pieces of EntityFramework and how they work together. Hope you liked the article and I thank you for viewing it. Thanks for the article. Learning a lot. Thanks for sharing this article.Waiting eagerly for next upcoming series on EF.. Thank you , That was so informative to me . I'm going to read all your EF4 articles . Can you please include a VB version of this tutorial? Nice description, helped me a lot, Thanks for this. A good article for beginners on EF.